* I created my card base using the Layered Labels 2 Cutting Files from Pretty Paper, Pretty Ribbons. I duplicated the bottom layer and welded the two shapes together to form a card base. * The cute little graduate is from the Graduates Cutting Files. I used a Peachy Keen Stamp (PKSC-01) for her sweet face. * I did not have ribbon in the shade I needed for my card, so I used a Copic Marker to color some white seam binding and there you go....custom made ribbon! * For finishing touches, I added a few white stitching lines, a pretty white felt flower and a necklace made of adhesive pearls. I also added Glossy Accents to her eyes for a bit of shine. Aren't they just cute as can be? Thanks so much for stopping by today! Be sure to stop by Pretty Paper, Pretty Ribbons to see what the other fabulous Designers have to share with you today! Just in case you missed it, Lisa also has the winner from our "Just For Him Blog Hop" posted here. Be sure to check out the winning name! 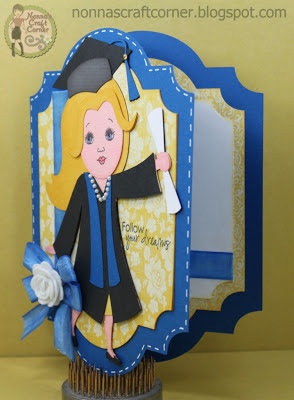 Such an adorable graduation card! I LOVE the shape, that adorable cut and of course that great PK face!!! Awesome job my friend! Thanks for sharing and have a GREAT hump day! So cute...just love the face...so perfect!! So adorable! These images are great! Your card is absolutely fabulous!! Just a DARLING card!! Perfect color combo and LOVE the shape of this card..I might just have to scrap=lift this one..LOL. 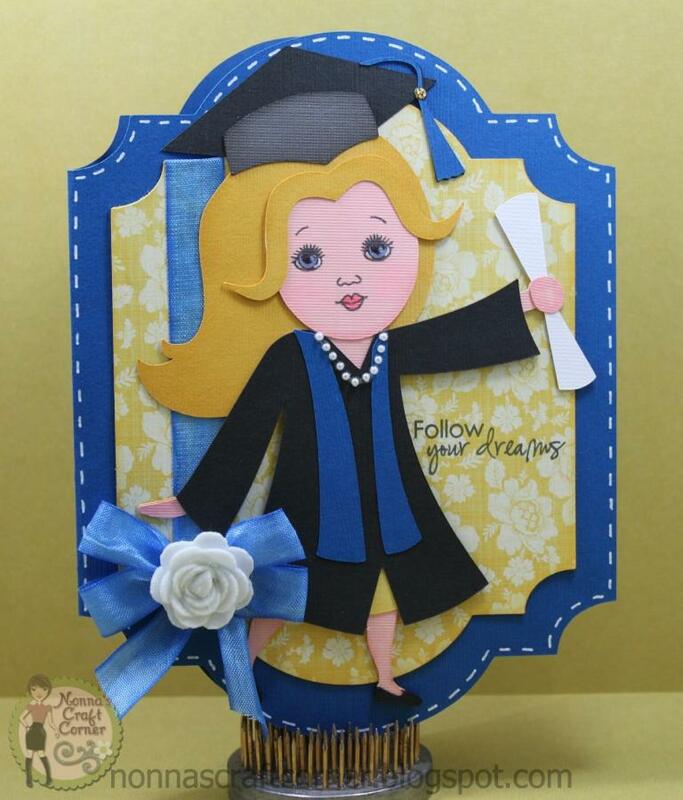 What an adorable graduation card! Thanks for the inspiration. Gorgeous. Love the shape, the image is beautiful. You coloring superb and that face perfect. Love it. Oh my gosh how cute!!! This is so beautiful!! Love the colors and that sweet face!!! I need to get some seam binding... I often have trouble matching ribbon so I need to do this! This is so cute! Love her hair and the face you used. Awww! She's the perfect grad girl. Pearls and everything. Beautiful!! Love her pearl necklace. Fabulous card Tanya. Love her pearl necklace and that you colored your ribbon to match!! Oh wow, what a GREAT grad card! That face kills me:) Awesome cut, great papers and super cute idea to add a necklace! love!